There's no great mystery about how to consume Serrano ham in the best possible condition, but it does pay to keep a few things in mind. Undoubtedly one of the most important factors is the temperature, which should be between 20 and 25°C, so that the Spanish ham retains and transmits all its organoleptic properties: appearance, texture, flavor and aroma. At these temperatures the fat is ripe for mixing with lean ham and makes it much more juicy. Serrano ham is often served sliced, for which some skill is required. Ideally, the slices are thin and not too long. Clearly, if the Spanish ham is not good there is little to be done, but it is also true that well-cut ham gains in the cutting and badly-cut ham loses a lot. So this last step is important. In almost every case hand-cut will be superior to machine-cut, so it's worthwhile to learn how to cut your Spanishham safely and well. The main reason has to do with the mechanical friction between the meat and the cutting instrument. When ham is machine-cut, a high-temperature disc is in contact with ham. The heat from this can even modify the flavor and cause loss of nutrients. However, by cutting by hand with a good knife, the smooth but firm movement of the knife blade allows the cutter to get the very best form the ham, and preserve all the nutrients (remember that Spanish ham is rich in vitamins E and B). The most common way to present Serrano ham on the table is with the slices on a plate, preferably arranged in a harmonious and attractive way to cover the entire surface. It is always best to cut only what is to be consumed at the time. In this way we ensure that the Spanish ham is as juicy as possible and that the organoleptic properties are preserved. Remember, the best way to preserve the slices is to not cut them until you need them! 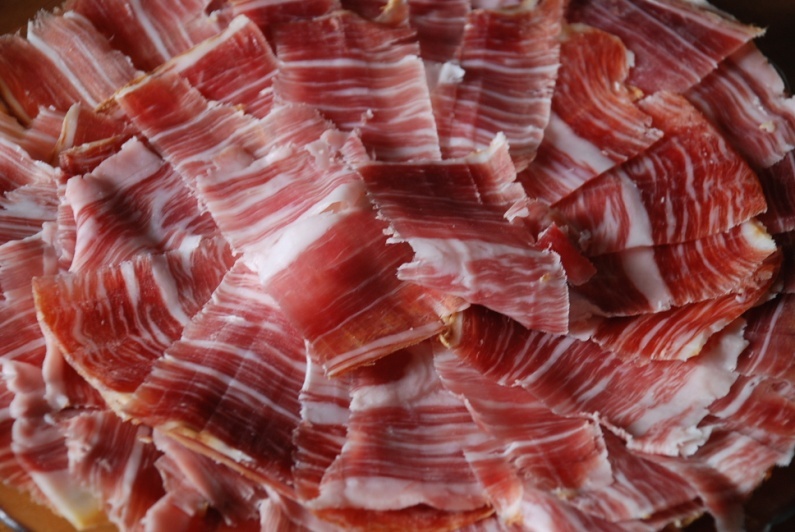 The traditional way to consume Serrano ham is to accompany it with bread and wine or beer. In some places it's traditional to prepare bread by spreading it with with tomato, or to or accompany Spanish ham with with drinks like fine wine, manzanilla or cava. What's interesting is that because Serrano ham has such a high content of umami (rated as the fifth taste), it is also an excellent ingredient in all kinds of recipes. Many of these are already traditional, such as melon or pineapple and ham, or ham croquettes, and all are very easy to prepare.